For years, I’ve heard about bible quizzing. At Newberg Friends, we’ve had teams of middle schoolers and high schoolers studying a book of the bible, and then traveling to tournaments where they compete against teams from other churches in our Yearly Meeting. I’ve not paid close attention until this year, when Talli decided to join. This year, they’re studying the book of Acts; and today, in the third tournament, the kids were quizzed over the first 21 chapters of Acts. Eleven teams of four middle schoolers quizzed against each other for 16 rounds today, spread out in rooms all over Sherwood Friends church. A question is asked, and whoever jumps up first gets the chance to answer the question. If you answer 4 questions right, you “quiz out”, earning 80 points for your team. If you answer three questions wrong, you “error out”, and don’t get to jump any more. Before this tournament, Talli’s best effort was quizzing out twice. I’ve known these 4 girls since they were babies, so it’s fun watching them still be great friends and now get to quiz together. From left to right, it’s Janna, Talli, Katie, and Stevie. This time, Talli quizzed out every round except for 1. We spent three years in Boise, Idaho, so it was great to see Boise’s team…they did great, capturing second place as a team. 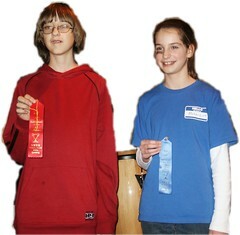 We got to go to the awards ceremony, where they announce the top 8 individual quizzers. 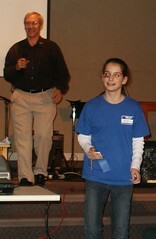 Talli was the top quizzer of all the middle schoolers! 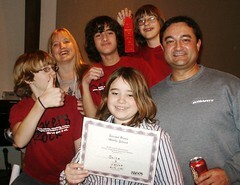 The icing on the cake was that Zach, whose family is great friends of ours from Boise, was top quizzer #2. It was a very fun day! We are looking for a bible quiz team in Boise. We live near the downtown corridor. Do you have any information? Thanks in advance.